Lairdland Farm House and Civil War Museum is open by appointment only. We are responsive to our customers’ scheduling needs and are open by pre-arranged appointment. Please do not hesitate to contact us for appointments during or after business hours during weekdays or by pre-arrangement on weekends. Tour cost in $20 per person and includes the plantation house, Civil War Museum, grounds, Traveler’s Cottage and gardens in season. 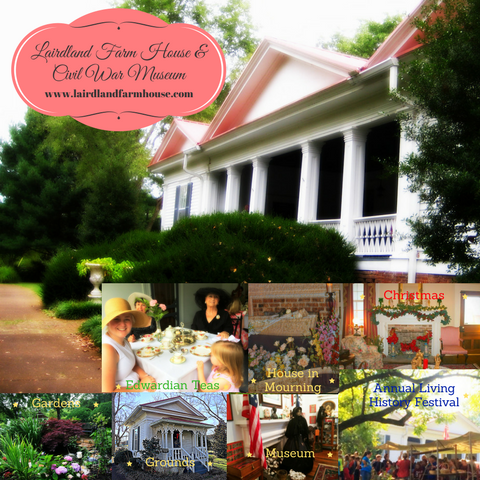 Throughout the year we host a variety of events that invite the public to Lairdland Farm House and Civil War Museum for entrainment and educational purposes. Follow us on Facebook, join our mailing list and check our event calendar to ensure that you do not miss anything.